Relevance Health > Community > Case Study > Could THERMAGRAPHY be the next best dental diagnostic??? The search for the root cause began. When she arrived at my office we identified no periodontal disease or contribution to burden via clinical, radiographic, and oral DNA testing. So, we did suspect dental infections. A 3D cone beam x-ray did identify 3 teeth with infections. She trustingly went with my recommendation of a specialist performing 3 root canals. They were performed beautifully and now it was time to wait for the next round of blood work to monitor inflammatory markers. I was feeling confident, until the phone call came in from Dr. Woods office that wanted to speak to me immediately. Her scores were three times higher and now in severe risk for an event. I invited the patient right after for a clinical exam and consult. No symptoms, no pain, no nothing. I decided to take another Cone Beam X-ray to compare to the last one less than 6 months ago for two reasons: 1) be sure we had not missed something that recently flared up and 2) to evaluate the success of the recent root canals. I even had the radiologist review both of the cone beams again in comparison. In-conclusive. However, when I sliced through the apex of tooth #18 and looked very closely at the surrounding area, I felt it could possibly be the culprit… but it could still be healing and bone simply had not formed in 100% yet. The patient had no symptoms whatsoever. But what really made me hone in on this tooth is that the apex only sat 1-2 mm away from the mandibular nerve and artery. If that was still infected could it be pouring right into her blood stream????? After discussing with Dr. Woods, I told her I was not 100% sure and it was hard for me to tell her to pull the tooth without more certainty. Dr. Woods was actually more bold and said just take it out. 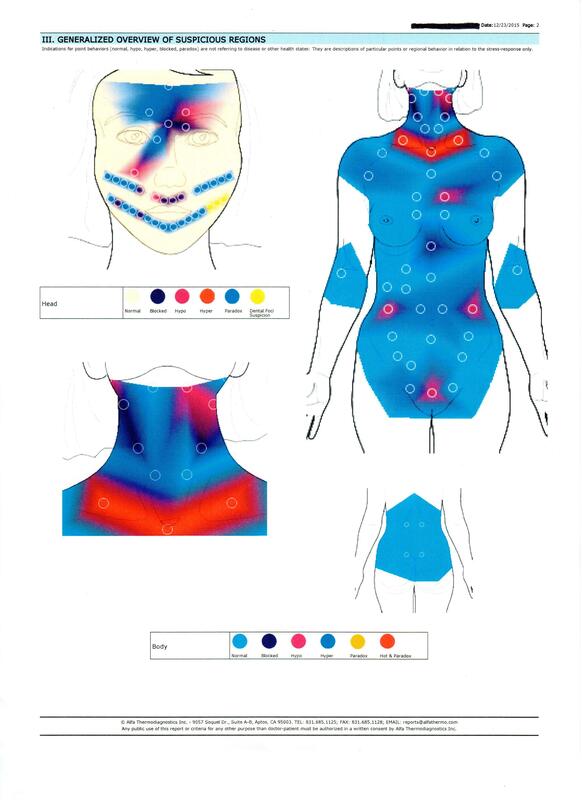 We had been discussing the technology of thermography on breast issues (she is a GYN) and how it might be beneficial to identify hot spots as we all are searching for root causes of inflammation. I stated I wanted to give it a try in this case. If the inexpensive non-invasive test could pin point a hot spot in her lower left jaw then I would advise the patient in a heart beat to have that tooth removed as quickly as possible. The patient agreed and we arranged for a full body scan the next week. THERMAGRAPHY may be the next best diagnostic tool in dentistry. Her scan lite up on the lower left quadrant of teeth. The area that follows the meridian line of the heart, if you are into eastern medicine. I will keep you posted on the progress of her blood work and how quickly her inflammatory markers go down now that her tooth has been removed. All I can say is WHAT WHAT! !